The purpose of the SIGUCCS Grant program is to provide partial support for individuals in institutions of higher education to participate in the annual SIGUCCS Conference. This support is funded by SIGUCCS and consists of a full registration to the Annual Conference; hotel room accommodations; and registration for one half-day pre-conference seminar. A. Qualifications— To be considered for a grant, an applicant must be a current full-time staff member in an institution of higher education. Preference will be given to those who have at least six months of experience in supporting information technology users. A maximum of three grants will be awarded for the Annual Conference. No individual may receive a grant for the Conference more than once. We particularly encourage submissions from employees at institutions that have not been represented at a SIGUCCS Conference in the past five years. B. Grant Applications— Grant applications must be submitted by May 31. The Google form will be available soon. C. Grant Notifications— On or before June 30, applicants for the current year will be notified if they did or did not receive a grant. Unsuccessful applications will not be retained; new applications must be submitted each year. Successful applicants will be given appropriate information about how to use the grant. Successful applicants must submit an acceptance of the grant by July 15, or the grant will be cancelled. Acceptance must be sent via email. 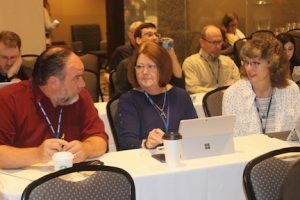 D. Grant Components— Each grant will consist of three parts: a full registration for the Annual Conference, complimentary registration for one half-day pre-conference seminar, and up to four nights of lodging during the conference at the conference hotel. All additional costs, including travel expenses, meals not included in registration, or additional nights at the hotel, must be assumed by the award recipient, hopefully with support from their institution.